Hi friends! Letting you know that this post is sponsored by The Little Potato Company. I love how convenient their products are- no peeling, scrubbing or chopping required! Thanks for supporting the brands that make DK possible. Hi friends, how has the holiday season been for you so far? It’s crazy to me that we are already well into December, just a few days from Christmas. Having a newborn around makes you realize how precious time is and how quickly it flies by. It feels like just yesterday I was preparing to go to the hospital and now we are packing up for our first plane ride as a family of three, just shy of Vander’s three-month birthday. This time of year feels even more magical now that our little bundle-of-joy has joined us, but I find myself already wishing that time would slow down. Just for a little while. I had so many plans for us this year. I wanted to take him to sit on Santa’s lap (sorry, not sorry), to host the neighbors for a cocktail party, to gather friends for a cookie exchange, to drink more hot chocolate, send out a holiday card, and more. Well, I haven’t done any of those things and the window to do so is quickly closing. Why is it that the most wonderful time of the year also ends up being the busiest? If you’re short on time but still wanting to make a super yummy side dish, this is the recipe for you. 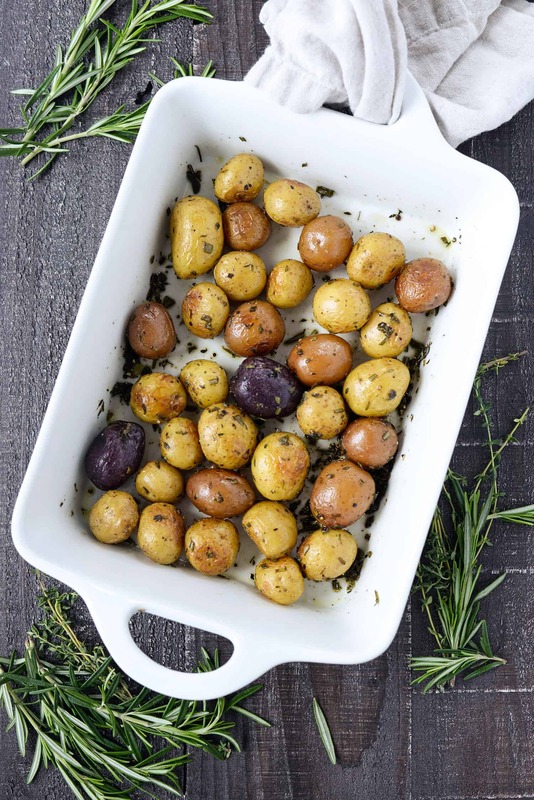 Perfect herb roasted potatoes that are a cinch to put together. I’ve made these a handful of times over the last month, a simple side dish for weeknights yet elegant enough to make for Sunday dinner with my in-laws. With everything that I’ve got to get done in the day, I love that I don’t have to scrub and chop potatoes before making these. I know it sounds like a small step, but it really adds up when you are wanting to get dinner on the table — fast. That’s why I’ve fallen in love with The Little Potato Company over the last year. They are perfectly portioned, perfectly bite-sized and already scrubbed, no peeling required. I simply open the bag, sprinkle with fresh herbs, olive oil and sea salt and roast to perfection. 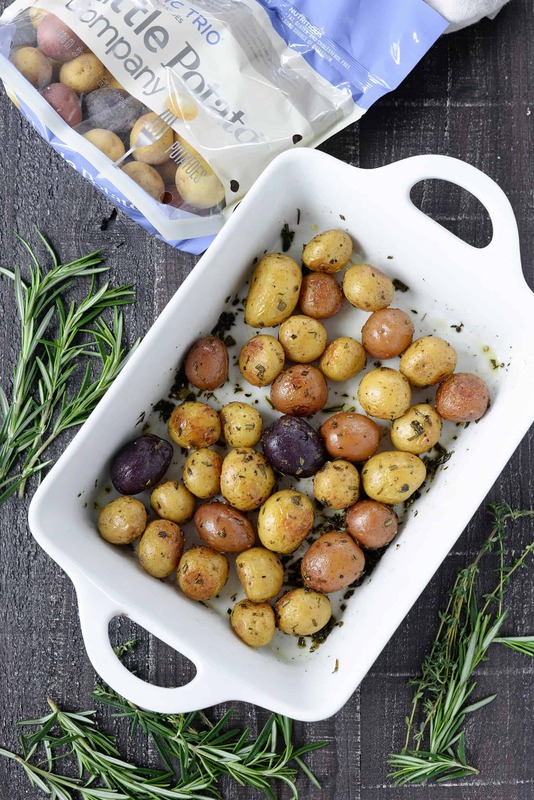 I almost called these my ‘Scarborough Fair’ potatoes as they combine the best fresh herbs of the season: sage, rosemary and thyme. My fridge almost always contains a few bits of these herbs from other recipes this time of year and they pair perfectly with the creamy potatoes. Don’t stress if you don’t have all of them, one or two will work instead. 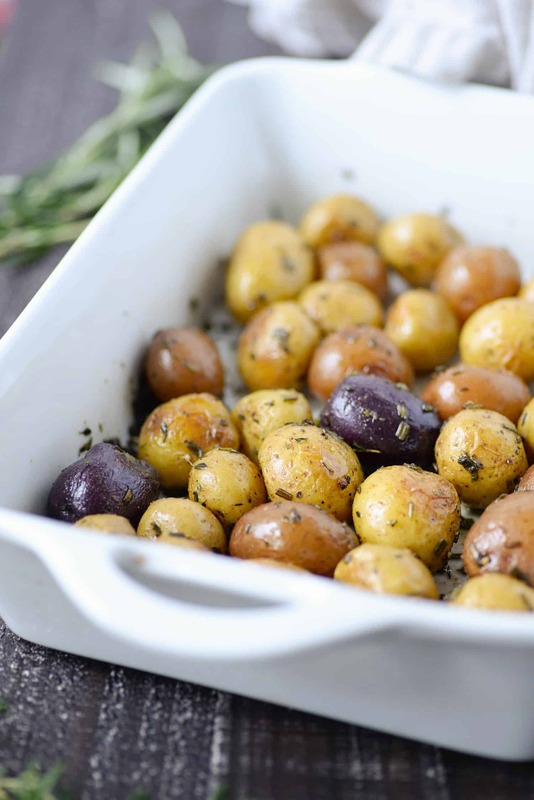 While all of The Little Potato Company potatoes will work in this recipe, I choose the Terrific Trio package for the gorgeous tri-color assortment. The yellow creamer is noticeably smooth and buttery, while the red has a sweet, earthy taste. The blue creamer surprises with deep purple skin that doesn’t bleed or fade during cooking. 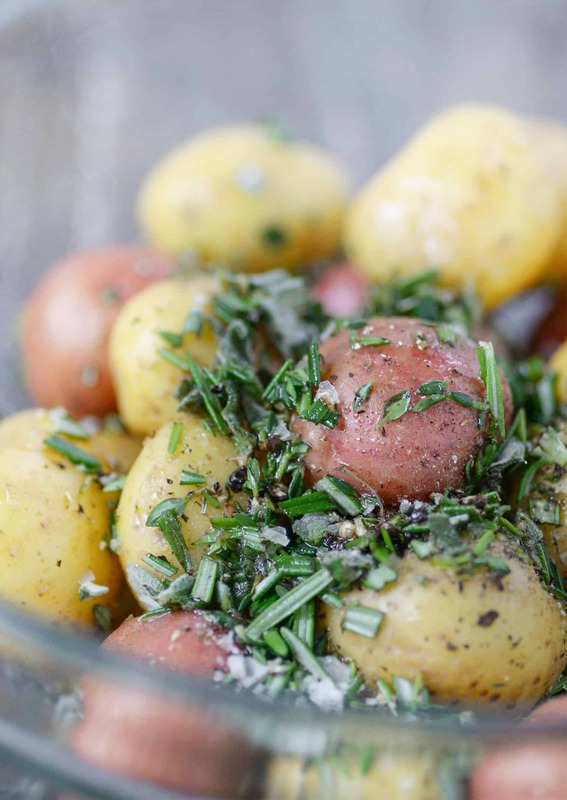 Perfect Herb Roasted Potatoes. These recipes are roasted with sage, rosemary and thyme. An effortless side dish for any holiday gathering. This post is sponsored by The Little Potato Company. I love how convenient their products are- no peeling, scrubbing or chopping required! Thanks for supporting the brands that make DK possible. As always, all thoughts and opinions are my own.